Graffiti is like weeds; it appears unrequested in all sorts of places and demands our judgement and attention. Call it street art or urban art, it springs up and smacks us in the eye. Like weeds, it may be relatively pretty but unwanted. Is it just art out of place? It is also a difficult word to spell. Should it be grafiti, grafitti or graffiti - most of us find it a touch confusing. Graffiti tends to be part of our everyday lives. 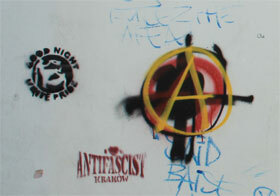 People use graffiti to express their desires, politics, loves, hates and ignorance. How often when driving a car have we spotted slogans such as 'Marry Me' scribbled in huge letters on a bridge and either smiled at the comment, been appalled or even laughed and wondered at how the graffiti artist managed to daub the bridge from a precarious angle. Graffiti artists sometimes seem to enjoy the challenge of not only producing graffiti but also a thrill of creating it in a dangerous or forbidden location. How do people manage to avoid being hit by a train near railway lines or paint under bridges with fast rivers flowing beneath? Graffiti is inevitably anti-social because in almost every case it causes harm to people in one way or another. The only exceptions to this are true works of art which are painted with consent or exceptionally gain acceptance because of their artistic merit. How many small businesses have suffered the cost of graffiti removal that may be little able to afford because someone has thoughtlessly sprayed slogans on their walls? Political hate slogans cause anxiety for the people who they are aimed at which is their true intention. This is nasty graffiti being used as a weapon. Lavatory walls and doors are another common place for a toilet graffiti attack. The comments are sometimes amusing but more often than not, malicious and vulgar, causing distress. The question of how to deal with graffiti in the UK has already been decided and councils invest a good deal of time and tax payer's money in eradicating it as soon as it appears. All that we can ask is that graffiti artists consider the social effects of their efforts and think about their intentions. Our attitudes to graffiti send out mixed messages. David Cameron, the British Prime Minsiter gave Barrack Obama a gift of of a painting of lettering by graffiti artist Ben Eine. Ben Eine admits that he still paints his graffiti in public places. Apparently shop shutters are good because graffiti remains there for longer. The confusion arises when we consider graffiti art. Graffiti is a worldwide problem that goes back as far as history itself. The word graffiti comes from the Italian word 'graffiare' and means little scratchings. The problem is that these little scratchings can turn into big ugly expensive messes.